It's been a long time since I posted on here and it's now my last week working at Wicken Fen so I thought I would put up a final post. My replacement may be persuaded to start her own blog, so the volunteer grazing warden blog may continue so look out for that! 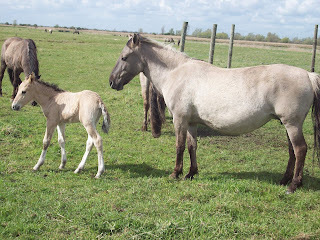 So in total this year, there are 13 new foals in the breeding herd and also 1 filly over on Verralls, born to the mare that was moved over last year (she conceived before we moved her). 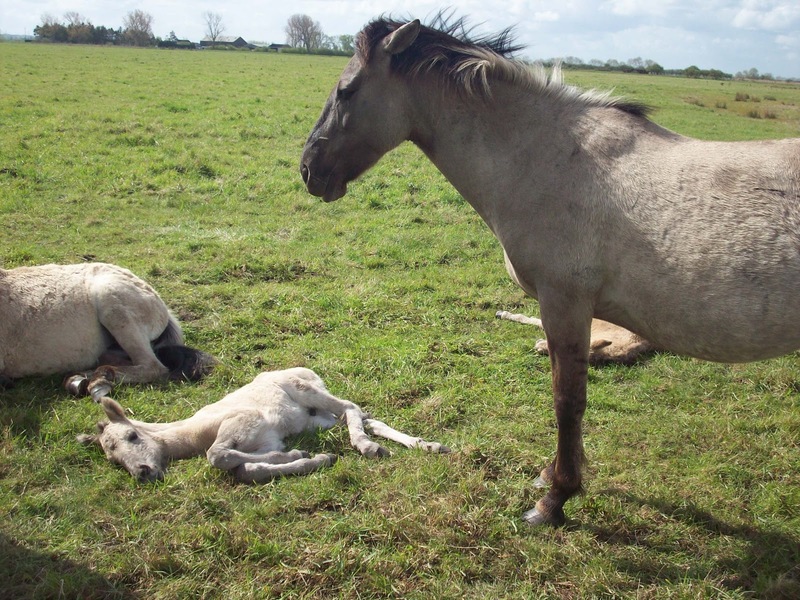 This birth was slightly unexpected, as we hoped that we had removed the mare from the breeding group before she conceived. 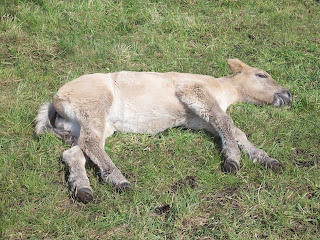 Her body condition dropped off a lot over the winter and it is possible that she won't be able to sustain enough weight this winter to be able to feed her filly. This will be closely monitored and there are options for us to move her up to our emergency paddock and be supplementary fed there with her foal. We will see how it goes, but ideally she will be able to keep on the weight and feed her filly! Apart from foals being born, the breeding herd have generally just got on with life on adventurers quite happily. The harems in the herd have been mixing up a bit recently and the yearlings have mostly been kicked out of their parental harems now and are either joining the bachelor group or forming their own little groups. It's a constantly changing social structure, but there are groupings that will develop over the coming months and some of these will stay around and potentially form new permanent harems in the herd. 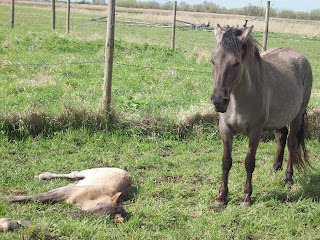 Over on Verralls, there has only been one major occurrence and that is the death of one of the geldings, Robin. We had noticed that he was lame on one of his hooves and monitored this closely to see if it would improve over time. After a while, the decision was made to call in our vet, Andy, and after examining Robin's leg, said the best thing was to euthanase him. 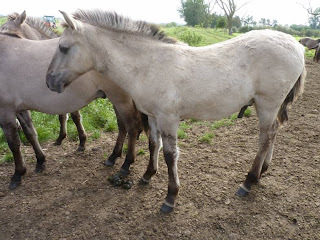 He had fractured his pastern, the equivalent of our ankle, and without the ability to pump lots of money/time into his treatment, our only option was euthanasing him. 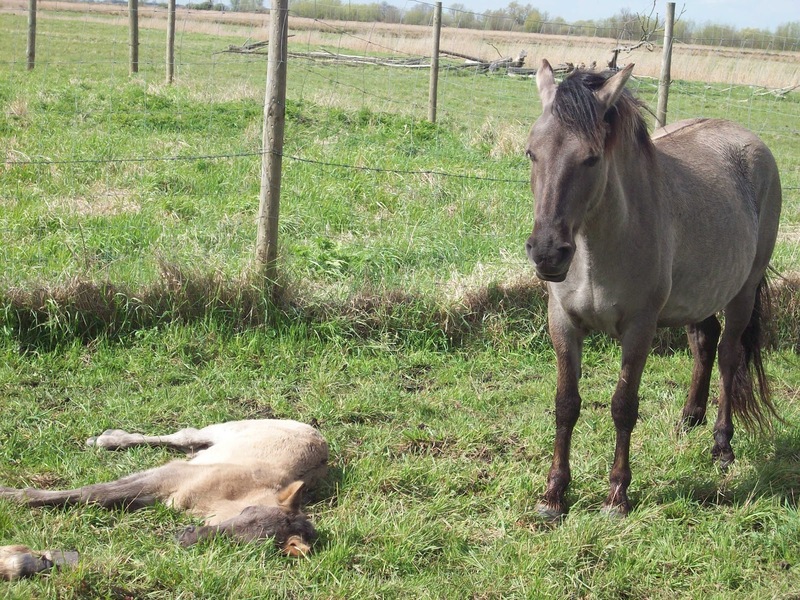 It was sad to see and witness, but I understand why it had to happen, especially in the grazing system that we have set up at Wicken Fen. 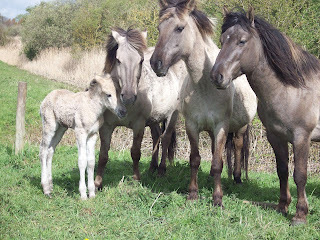 Apart from Robin, all the others are well and the new little filly has settled in well with everyone. The new calf on Harrisons was born to Megan, our blonde cow over with the bulls. The calf is a heifer and was born on Monday, so is still very small and fluffy! We eartagged it on Monday, as it's easiest to get it done as soon as possible, and noticed that it wasn't very steady on one of its hind legs. Since then we haven't seen it standing/walking, although this could be because the mum wants it to just hide away. The cattle's strategy is to stash their young away for the first week or so, before it spending more time with the rest of the herd. We are expecting the calf to be standing up and wandering around by next week though, so hopefully she will be! We have also sold off a few of our cattle. 4 cows have gone to Derbyshire Wildlife Trust and 1 bull has been sold to a local farm (he has now got his own 3 cows to take charge of!). At the moment, decisions are being made about when and how we are going to move our cattle around, to form the new breeding and non-breeding herds. We are hoping to do some of these movements in the next month or so, which will be an exciting time! 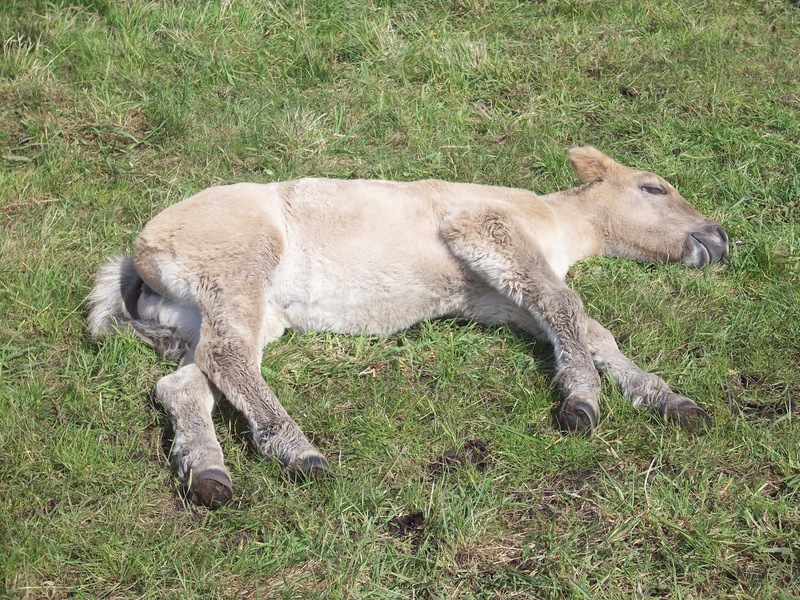 Anyway, thanks for reading and do check out the (potential) new volunteer grazing warden's blog if she decides to start one! This week has been so nice being outside in the sunshine, and I think the animals are appreciating the slightly warmer weather too. Yesterday I was out doing the monthly condition checks on the koniks, when they then decided to have a roll around in the water out on bakers! As you can see by these pictures, the water is pretty grim for a roll in, but the koniks seemed to enjoy it and it cooled them off nicely. Apart from the monthly checks on the koniks, the cattle checks were completed too. The final parts of preparation for Saturday's 'Careers with Animals' day was completed too, so we are almost all set for that. On our stall, we'll have general information about conservation grazing, Wicken Fen and the National Trust. We are also meant to take an 'entertaining activity' according to the CAW, so we are taking some poo analysis equipment. I'll collect some dung tomorrow from one of the koniks, and then we'll take all that we need to make a solution and look at some under the microscope for a worm count. I don't think 'entertaining' is the first word that comes into mind, but hopefully people will find it interesting! Around the fen at the moment, there are definite signs of spring - everything seems to be coming to life a bit more, and the place seems to be filling up with birdsong and spring wildlife. I was out on Monday afternoon and this afternoon collecting some data for my project on the bulls, and although there was hardly any aggressive behaviour to record, it really makes a difference when you're standing for an hour in the sunshine rather than the cold! Over on Harrisons, there seems to be a couple of barn owls that are settling in one of the willows - I'm not sure if they will nest, but hopefully they'll stay around. If you walk down Harrisons drove towards Wicken Lode, you might catch sight of them - they're towards the reed beds (in compartments called Rothschild&Lapwing), about half way into the bulls' fields. Over in guinea hall, there are lots of skylarks busy singing away in the fields, and many will nest in the fields as it's ideal habitat for them out there. Next week, I won't actually be working out on the fen. I have a week's work experience at a veterinary surgery in my home village, which I'm really looking forward to! I'm potentially thinking of veterinary nursing after my placement here, so next week will (I hope) help me decide whether I definitely do want to do this or not. So until I get back next time, thanks for reading! This week there has been a new addition to the breeding herd of koniks - Yara, one of the mares in Charlie's harem has had a filly! She is so cute, I went out this morning with one of the lookers, Carole, and managed to get some pictures. A couple of visitors around the fen managed to see her being born and then phoned the visitors centre to let us know about it. Carol and I went down straight away to check out how it was doing and stayed for a while until it looked like it was able to stand up. It's amazing how quickly they're able to stand and walk around - usually it's between 30 mins - 1 hour old when the foal is able to stand! Thankfully this filly seems healthy and happy. 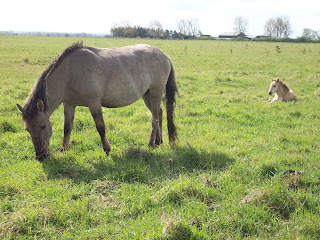 Her mum Yara seems to have bonded well with her and Charlie has been good so far at protecting them both from the other curious stallions who get a bit too close!.. 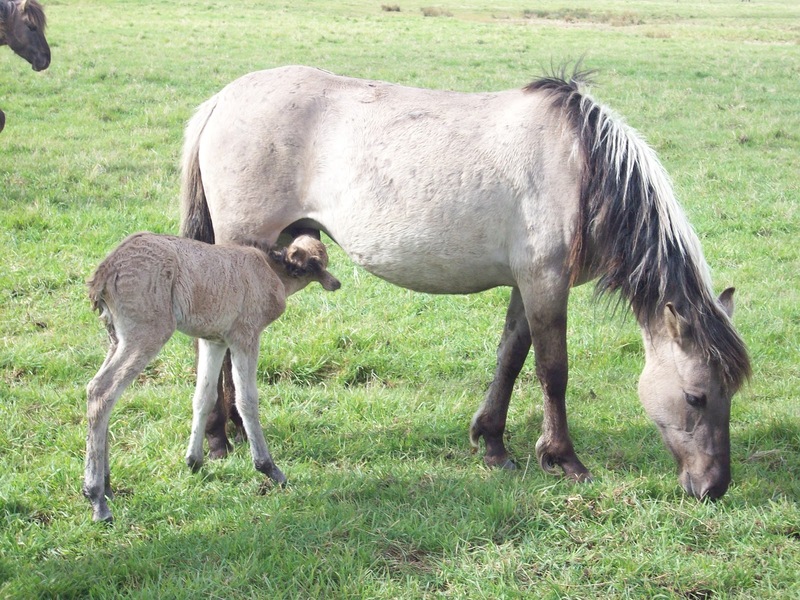 Even though Yara is part of Charlie's harem, she only joined it last summer so chances are that this foal isn't actually Charlie's. Still, he's protecting them well! Apart from then new addition, things with the grazing animals have been fairly quiet this week. The breeding herd of koniks are becoming more active as more mares are getting closer to foaling and then will come into season. The non-breeding herd on verralls have a totally relaxed, quiet life without the fuss of harems and fighting off other stallions from their girls. This summer, 8 of our cattle will be moving over onto verralls to form a small non-breeding herd. It will be strange seeing cattle out there! The individuals moving over have almost all been decided on, so there will be a mix of (castrated) bulls and cows. They'll affect the vegetation in different ways to the koniks that are already there, and hopefully they will help keep some of the scrub down, which is important for preventing succession going too far. Anyway hope you have good weekends and thanks for reading!